Now, that I think I have finally finished all of the pumpkin and Oktoberfest beers, I have moved on to the winter ales. 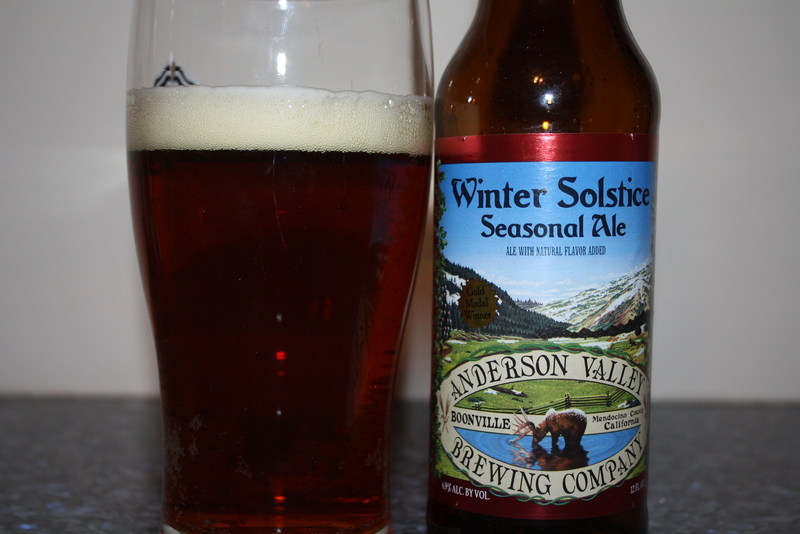 The first on that I have tried is the Winter Solstice Seasonal Ale from the Anderson Valley Brewing Company . Located in Boonville, CA, AVBC has been in operation since 1987. Presently, they produce 8 beers year round, two solstice brews and the limited edition Bahl Hornin’ series, (that means “good drinking” in Boontling). In the past, we have reviewed the Summer Solstice. the Boont Amber Ale, a three can effort (the Boont Amber Ale, The Hop Ottin’ IPA and the Barney Flats Oatmeal Stout) sent fresh from the brewery and the Imperial IPA. Having had some mixed opinions of the brewery, I decided to give the Winter Solstice Seasonal Ale a try. Each year, when people are starting to unpack their winter clothes and replenish their firewood, our tiny brewery in the coastal redwoods of Northern California makes seasonal preparations of a different kind. As the cold arrives, we release a unique beverage created to add warmth to even the coldest and darkest of winter’s days. Winter Solstice Seasonal Ale begins with a very high original gravity to create a hearty and spicy brew with a deep amber hue and a smooth finish. Anderson Valley Brewing Company wishes you the very best for the holiday season and the New Year. Appearance: Ruby tinged amber with tan foam. Aroma: A little like a barley wine, hoppy and grapey. Taste: Sweet malt and then a big, bitter taste followed by a short dry finish. This was an okay beer. It was not overly spiced like some winter warmers; just a well-balanced blend of malt and hops even though I would have liked a little longer finish. Sounds like another beer from Anderson Valley that just okay. I am okay with a beer being just okay. It wasn’t some overly spiced seasonal concoction just a nice blend of flavors. I would put this up there with the Imperial IPA and the Barney Flats; respectable but not world class. Do you think they have boontling available on Rosetta Stone? I did find too many winter ales with the typical holiday spice. Not sure if boontling is worthy of Rosetta Stone as I fear it is just some sort of local gibberish. And, I’m with you; winter ales should be a heftier warmer not taste like a Christmas tree or holly bush. I had this in a bar recently. It thought it was awful. It might have gone a little skunky but not a good first impression of AV for me. We have had a couple of these that seemed a little “skunky” while some others were good (not great but still good). I’m not sure if it was the beer or the handling from the West Coast to the East Coast. This might be one of those brewers that doesn’t hold up to long-distance shipping and where the born on date is really important.